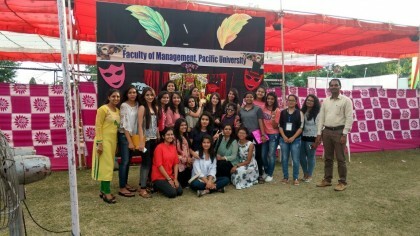 Recently, the students of Mody University, Lakshmangarh, College of Business Management, Economics and Commerce participated in “Uniquest” a management carnival conducted by Pacific College of management, Udaipur. The two day fest from 28th -29th September had an array of events from both the fields of academics and cultural. The students participated in various events like extempore, singing, quiz, debate, business plan, sketching, nail art, dance, fashion show and gave their remarkable performance in all. They faced stiff competition from over 50 colleges and yet proved their mettle and caliber by securing various positions in different competitions. The students secured the second position in business plan presentation, with the team comprising of team members Miss Stuti Jajoo, Miss Shalini Dwedi, Miss Prashansa Sharma, Miss Shivangi Dhaka and Miss Divya Lamba. Miss Prashansa Sharma won the 2nd prize in the visual extempore competition, while Miss Yashi Chandra was successful in winning the 3rd prize in debate competition. The cultural team comprising of (Niharika Lalwani,Megha gupta,Simran Dingara,Udita Somani,Sindoori chaube,Sanjana Ganatra, Vinita bhatiya, Kajal jain, Nerisha tandukar ) gave their outstanding performances and won the second prize in the fashion show, smitting the audience with their gothic theme and grace. Miss Ishita Jawal also showed her brilliant creativity and was successful in grabbing the second prize in the nail art competition. The students gave wonderful performance and the cobmec, mody university won the award for being the “All-rounder College” of the event. Overall the event was a great platform for the students to learn and show off their mettle .They indeed brought pride and prestige to the college.